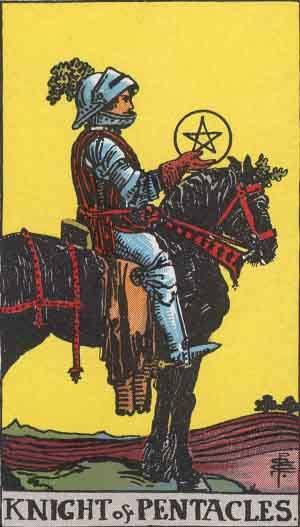 The Knight of Pentacles is the 12th card in the suit of Pentacles. A positive card, you should expect good things to happen when you see it, especially any news regarding a younger male you might know. As you may expect, the card embodies some knightly qualities; things many of us would do well to aspire to. The Knight of Pentacles represents patience, routine and dependability. Past – The Knight of Pentacles in the Past position can represent a past event where you were dedicated, loyal or responsible. It could have been a time when you were in charge of something. Do you need something like this now? If you’re struggling now, think back to that past time and try to remember how you felt to further motivate yourself. You might need to put things into perspective and work by priority. Present – The Knight of Pentacles in the present position means you’ll be motivated and possibly inspired by somebody younger than you, especially if you’re currently bored with life. This could possibly mean someone physically younger, but can also mean somebody new to an activity that you’re a part of. Don’t be put out if they start doing better than you did when you were in their position. Future – The Knight of Pentacles in the future position suggests that the near future will be structured and methodical. if you’re aiming for a goal, stick to the plans you’ve set out. Sometimes, people can ask things of us that disrupt what we want to do, but it’s usually better to help others over yourself first. Work / Education – The Knight of Pentacles in regards to work or education means a new leaf, a new start, but in a more revolutionary way than The Ace of Pentacles suggests. You might land that job you always wanted, or possibly move a step towards that path, but more likely you’re going to stand out where you are currently. You might have some new ideas on how to work or study, now is the time to implement them. This could be very beneficial in a workplace. If you have new ideas on how to work, make sure you make them known now. Take credit for things that you have done to make your workplace more efficient, as well as a more enjoyable place to spend the day. Romance – The Knight of Pentacles in romance can signify ‘the Knight in shining armour’ that your partner, or potential partner is looking for. You’re going to need to be responsible for yourself and your partner if you’re in a relationship, so don’t shirk away from taking a leading role. If you are single, then look to be willing to make a serious commitment to another person when the opportunity arises. You might need to go out of your way to meet somebody new, and this could mean doing something that is completely out of your comfort zone. Friends – The Knight of Pentacles in regards to friendship could mean that there are a few small problems or bits of harmful gossip that are circulating your circle of friends. They’re just little things, but it might be worth taking care of them now, especially if it’s related to something you’ve done. Don’t slack when it comes to your friends, be honest with them if they ask a favour of you. It’s not the time to be lending people things either, and if you have let a friend borrow something valuable, don’t feel guilty about asking for it back now. It is yours after all! Money – The Knight of Pentacles in regards to finances is another good sign. Expect your bank balance to increase, and at the very least, don’t worry about money for the time being. You might be tempted to risk something important for some extra cash, but you know it’s probably not the wisest move. Don’t take any chances that you can’t afford to lose. If you’re waiting to hear about anything related to money, then expect it to be good news. Health – The Knight of Pentacles suggests that you should stick to a good routine when you’re considering your health. A balanced plan for your diet and regular exercise will help you achieve your potential. Is there anything stopping you from doing this? Work out what it is, and stop it happening. Make little changes first. Our lives can change so much when we eat correctly and exercise enough. Do not stagnate. You need to treat your body right, it is a shame to see a human body not at it’s potential. Spirituality and Mentality – The Knight of Pentacles can mean that you need to get practical with your spirituality. Make it a part of your daily routine; a small prayer when you wake up, or some mindful meditation during the day. You need to manifest your mental state into the real world. Take things slowly, but be sure to make the spiritual world a part of your life in the coming weeks. The negative aspects of the Knight of Pentacles are highlighted when the card is drawn in reverse. It can signify excess, hedonism and a lack of self discipline. There are likely things that you want to do but you haven’t, simply because you cannot muster up the motivation to do them. We can all dream, but really only very few of us actually continue to follow our dreams through our life. Many of us simply reach a point and we get comfortable and stop when our needs are taken care of. Be sure you don’t turn fully into a sloth. You may need to spend some time reconnecting with what you really care about in the world before you are ready to set off on another path. We’ve selected live tarot readers to give you a FREE 3 Minute interpretation of The Knight of Pentacles! Scroll through them below and pick your favorite one.